PREPARATION…One Word, Express In One Hundred Words In One Hundred Days. 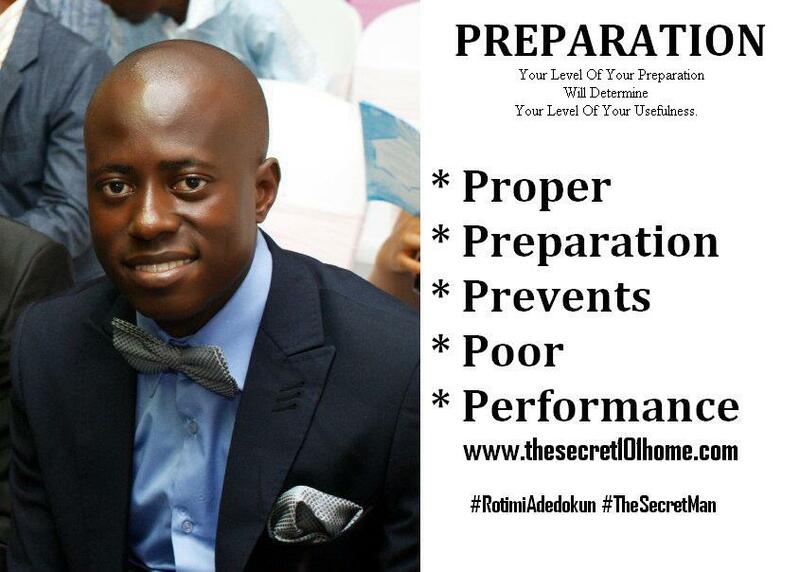 Your Level Of Your Preparation Will Determine Your Level Of Your Usefulness. Preparation Strengthens And Breeds Confidence. Preparation Is About Living Ready For Your Opportunity. Preparation Is The Act Of Faith, Which Makes One To Live Ahead, Stay Ahead And Propel To Action. Life Outcomes Are All Products Of Your Capacity Of Preparation. As Solider Don’t Prepare In Battlefield, But Prepare For Battlefield. So Nobody Prepare In Life To Win Life, You Have To Prepare For Life To Win. You Can Prepare Ahead But You Cannot Prepare Enough. Life Results Are Function Of Adequate Preparation. This entry was posted in Life and Time Management, Love, Self Development, Spirituality, The Peace, The Secret, Vitamin Of The Mind, You! and tagged Adequate Preparation, Bishop David Oyedepo, How To Prepare For Lffe, Jim Rohn, Pastor E A Adeboye, Preparation, Proper Preparation, Rotimi Adedokun. Bookmark the permalink.